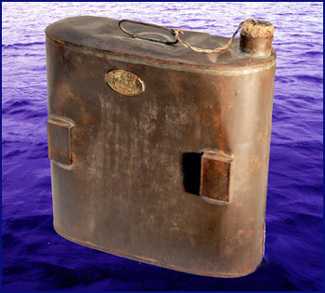 Because they are rarely used, and so never worn to pieces, and also because they usually nicely labeled with the names of their vessels so that your sodden body can be 'sourced', life jackets are rather helpful artifacts, no pun intended, to a collection manager. 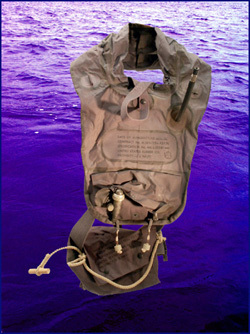 Imagine fumbling with wet, cold, paniced fingers to get this child's life jacket (above) onto someone's frightened crying offspring, maybe even your own, in the dire confusion of a sinking vessel, probably in bad weather, heaving ocean, and a variety of potential calamities, such as fire, boiler explosion, or collision. You could never do it, because (look closely at the horizontal strap) the buttonhole is sewn too tightly for the button to go through. This one at least buttons, but the jacket is only as good as the hand stitching that holds the cork in the pockets, and the soundness of the cotton fabric, which could easily degrade in the, hopefully, idle life of prolonged storage to which these preservers were fated. Encouragingly, this particular one has been peppered with inspection stamps on the inside face of every block, ranging from 1911 to 1934. 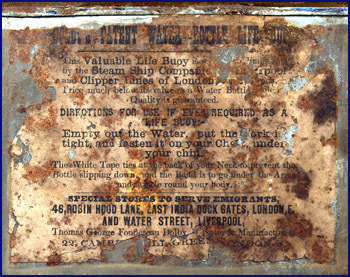 As can be discerned from the fragile label (below) still attached on the back, this Water Bottle-Life Buoy (above) was marketed to emigrants as a necessity that, in the event of a sinking, could be emptied, re-corked, and tied across the chest with cloth tapes through the metal loops to keep one afloat. 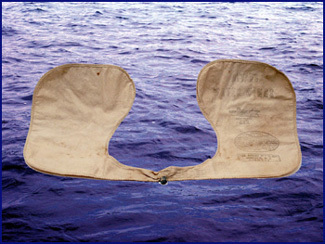 These cloth water wings, made by the Ayvad M'f'g Co. in Hoboken, NJ, and patented in 1901, claim to support a swimmer of 250 lbs. 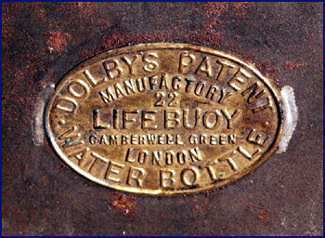 Like the Water Bottle-Life Buoy above, there is a pitch printed on the product to persuade: "Water Wings are purposely made porous to allow just enough air to escape in order to adjust themselves properly." This is called floating an idea. 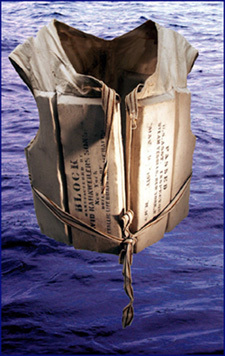 "SS Howard T. Ricketts" stenciled on the back of this kapok fiber filled life vest made in Amesbury, Mass., tidily reveals a date between 1943 and 1967, which was the lifespan of this particular Liberty ship. 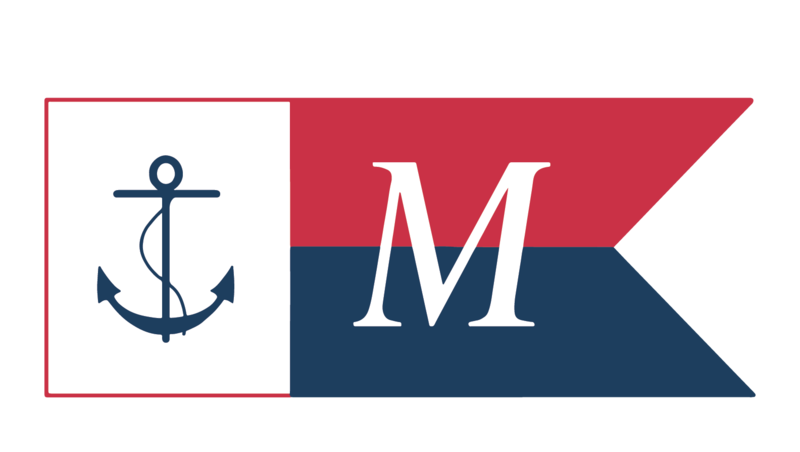 Built in 40 days in '43 at the California Shipbuilding Corp. in Los Angeles, she survived WWII to charter freight under Liberian and Taiwanese registration, ultimately being scrapped in 1967. Kapok is an air-trapping silk-like fiber found in the seed pods of a tropical tree. 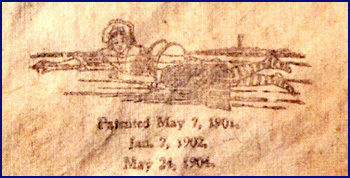 It gradually displaced cork in life preservers as it could be more readily configured into designs that better floated a comatose survivor. 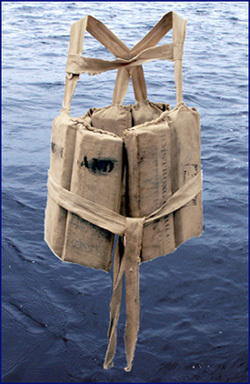 Cork blocks were also known to slam into one's face upon hitting the water, even to the point of breaking one's neck. The olive drab of this vest is presumably war-time issue; note the red safety light. 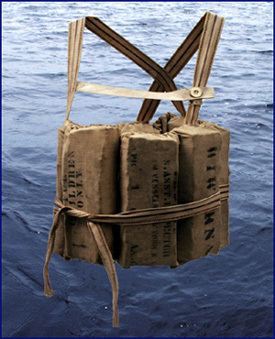 At the more recent end of our life preserver time-line, this US Navy pouch vest, date-stamped May 1951, in the midst of the Korean conflict, was originally designed for flight deck personnel. 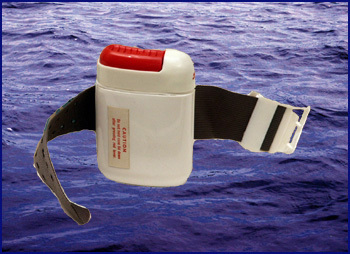 The model is still in use with slight modifications like reflective tape and high visibility orange color. It was worn compacted in the belt pouch, to be inflated at the pull of two CO2 cartridge lanyards. If they failed, there is a mouth blow-up tube. 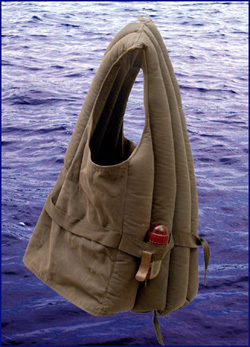 There is an air-rescue hoisting loop by the neck hole; the wooden toggle on the bottom lanyard is meant to tie you to other floating survivors. Dubiously ingenious ideas persist even as technology advances. This ca. 1970 "Aqua-Aid Wrist-Pak" bursts open upon hitting the red button, to inflate a re-usable vinyl airbag. Presto, "Instant Life!" At least your hands will be held above the water.